I made Andrew look really scruffy in this strip. In reality, he only had a soul patch for a very brief period of time. Andrew always thinks people are hitting on me. Why are TMBG the official nerd band, anyway? It’s not like they sing about specifically nerdy subject matter, like, say, Jonathan Coulton. But nerds know and claim them as their own. They give off nerd rays. It’s probably the glasses and the flannel and all. For the record, my favorite TMBG songs are “She’s an Angel,” “Ana Ng,” and “Birdhouse in Your Soul.” Although Andrew is not a nerd and generally has much better taste in music than I do (but my tastes are more interesting! ), he has been known to declare that “Birdhouse in Your Soul” is a perfect song. Geez, I’m such a nerd. Still, this strip is kind of noteworthy as the first of the totally unrelated autobio comics I sometimes ran on Sundays over the course of Narbonic. I usually drew these very quickly without pencilling first, which is why they look like this. The other folks at the concert are my college friends Lisa and Mee-Lise. Lisa is dancing a mazurka. Andrew says that the TMBG autograph session was the only time he’s seen me go completely fangirl on somebody. And we’ve met a lot of major celebrities over the years. Like the guy who played Lupus in The Bad News Bears. The King Dapper Combo is an extremely local Ohio junkabilly band to which I was extremely devoted in high school. Andrew: Is it wrong that when I listen to your They Might Be Giants albums, I can picture the notes coming up in Accordion Hero? My favorite song of theirs is experimental film. I was introduced to it when Strong Bad did a video with it. The way I remember it is that Linnell is line-like (i.e. skinny). I live in Brooklyn and so see TMBG pretty often. I always wanted to ask them if they knew about this comic, but I’m a bit shy about this sort of thing, so I always told myself that people probably asked them about this comic all the time. Has anyone actually mentioned it to them, or should I try to talk to them the next time I see them loading out their equipment at Southpaw? I love these True-Life Stories! So earnest and endearing. Also endearing: the verb “gushes”. I actually created a page for “Accordion Hero” on Uncyclopedia, about a month and a half ago… I’m pre-emptively stealing ideas! Hurrah! Flugelhorn hero is all mine, though. ^_^ Ah, a Schadenfreude Studios fan? Personally, I’m waiting for NachtMusik. I mean, survival horror and karaoke… what a combination!Incidentally, cute dancing dancing poses in the 4th panel. Reminds me of my own dancing. I rerember watching that Tiny Toons bit, and just really loving the accordion solos. Gotta love accordion solos. Terry Pratchett FT weeping, wailing and gnashing of teeth. For some reason, I’ve never liked TMBG. It’s one of the major gaping holes in my Geek Cred. Believe it or not, I’d never heard TMBG before. I listened to ‘Istanbul’ and ‘Alphabet of Nations’ and they were great. Then I heard ‘Dr. Worm’ and I was back to wishing I’d never heard them before…. Edward (reynard): thanks for the link! Greatest tiny toons episode ever! My intro to TMBG was “purple toupe and gold lame” so I was already scarred for life. Mine was “Birdhouse in Your Soul,” which a friend of mine wanted us to karaoke on my birthday despite my only having heard it for the first time earlier that day. It is now my favorite TMBG song and my signature karaoke tune. 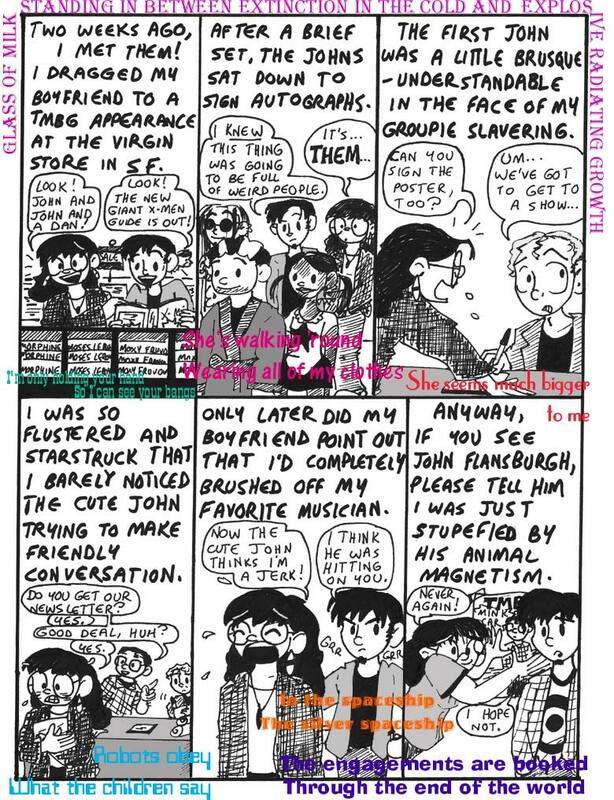 All I can say, is that when I first read through narbonic, I flipped out once I realized the page was plastered all over with TMBG lyrics. 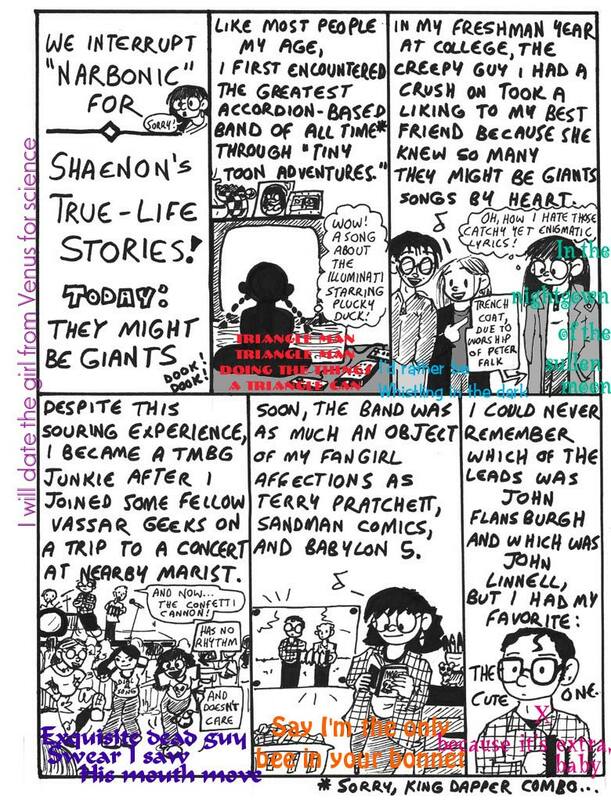 And it just shook me up even more, as I realized that one of my favorite webcomics, was by someone who was a fan of one,of my favorite bands.